The chefs really enjoy putting on a show in the open kitchen at The Traveller, the bright and spacious restaurant at the French-owned Mercure Riga Centre Hotel near the central rail station. If you love pasta, sushi or ice cream – or all of the above – then sit and watch it being made with expertise, right in front of you. 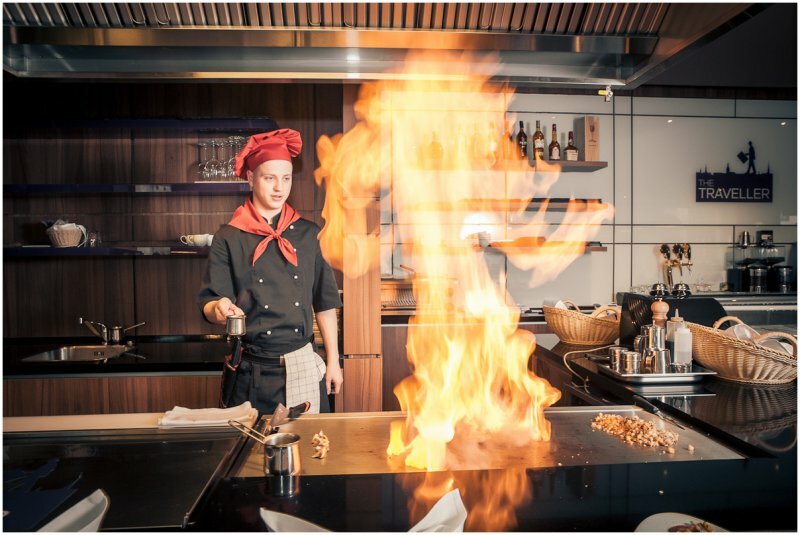 At one end of the kitchen, a uniformed teppanyaki chef alarmingly juggles a big knife, a giant pepper pot and a bottle of oil, which he shoots onto the propane-heated iron plate producing a volcano of flame. Excited guests feel the rush of heat. They don’t have to wait long for their baked sushi rolls or top-quality steak. The brand Mercure is part of the hotel giant Accor, which ensures that all employees including the professionally attired chefs and waitresses are trained to high standards. But at the same time this air-conditioned restaurant with its playful décor of violet, yellow and blue relies more on a casual and informal atmosphere than on any superficial elegance. Live music jazzes up the atmosphere even further on Friday and Saturday evenings from 7pm to 10pm. Near the sushi zone is the pasta zone, where we sat and watched the chef make ravioli before our eyes. He combined green and yellow pasta dough, put it through a machine to make extremely thin slithers, added the filling of our choice, cut it up and sealed the pieces. Dishes are priced around the €10 mark. A daytime (noon to 4pm) menu brings prices down to €4.50 per set dish, or €7 for two. Don’t leave without trying the homemade ice cream in 11 different flavors. A word of caution: If you’re approaching from the north, take care getting here as it’s dangerous crossing the wide road in front of the hotel. It’s safer to walk from the rail station. food (instant food, bread, crackers) 24 bottles of water or other drinks. It will save you a lot, dont assume you can buy.